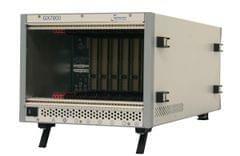 A fully compliant 19 slot PXI chassis that can accept any 3U PXI or cPCI module. The chassis is ideal for bench-top use or for use in a rack system. The 40-923A includes all the features and performance required by the PXI standard and supports a control interface or embedded controller and up to 18 additional 3U peripheral modules. The control interface can be provided by our PXI Remote Control Interface Kits, allowing the chassis to be controlled from a PC. The chassis is fitted with a 600W industrial grade power supply mounted at the rear of the unit with sufficient capacity to support PXI modules with very high current demands. An intelligent chassis management system monitors the power supply voltage, internal temperature and the cooling fan speed.